A list of results will appear. 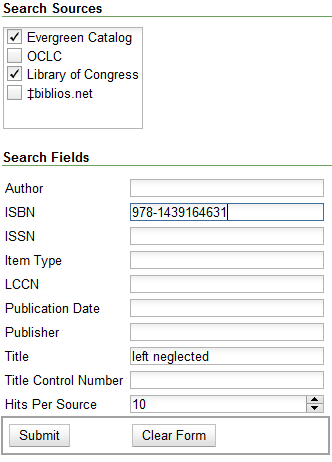 Click the Copies link to add copy information to the line item. See Line Item Feratures for more information. Click the Notes link to add notes or line item alerts to the line item. See Line Item Feratures for more information. Enter a price in the Estimated Price field. You can save the line item(s) to a selection list by checking the box on the line item and clicking Actions → Save Items to Selection List. You can also create a purchase order from the line item(s) by checking the box on the line item and clicking Actions → Create Purchase Order.